Music is a vibrant force at MCC Portland. We offer a variety of music ministry opportunities for anyone who wishes to be involved. In most cases, reading music is not required, just a desire to ‘make a joyful noise’. This choir ministers mostly at the 10:00 AM Sunday service as well as special performances such as the Christmas Concert or at Harvest Dinner. The choir shares the Sunday service with the Awakening Band. Rehearsals take place every Sunday from Noon to 1:00 PM in the Sanctuary, following a short lunch potluck at 11:30AM. Reading music is not required to be a part of this choir, only the ability to carry a tune! The choir sings a variety of styles of music from classical to gospel. If you have questions, feel free to email the Music Director. This group of singers and musicians also ministers at the 10:00 AM Sunday service each week. Awakening shares Wednesday rehearsals but starts at 7:30 PM. They offer mostly contemporary Praise and Worship style music and some gospel music. Reading music isn’t necessary, but being comfortable on an individual microphone is. If you are interested in this ministry please email or call the church office. 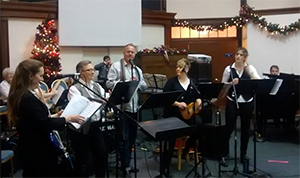 MCC Portland often invites individuals from the area and even around the country to sing selected songs and perform at special concerts. If you are a soloist or instrumentalist and have interest in offering your gifts at MCCP, please email the church office or call 503-281-8868.